Here is my second Christmas in July project. It is a Christmas Spicy Spiral using all Christmas fabrics that graduate from dark green to dark red. I will not be completing this project right away. 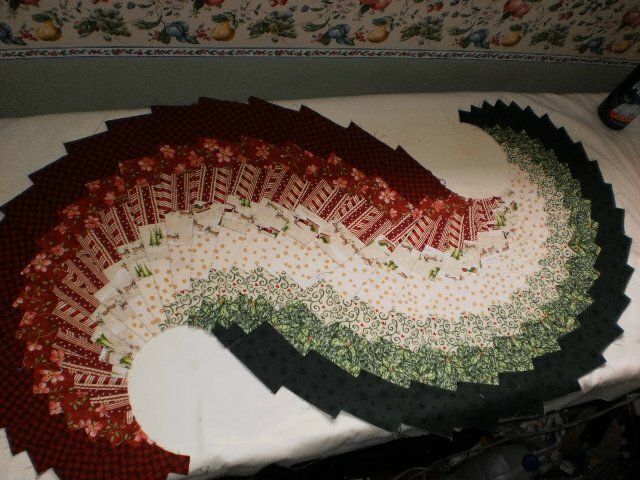 I will use this as a sample if I get to teach this Christmas Spicy Spiral to some local quilt guilds this fall. Just between you and me, this sample is actually not sewn together. I just placed it together for the photo. Here it is before I placed it together for the photo. It is what the Spicy Spiral table runner like before the final middle seam is made. 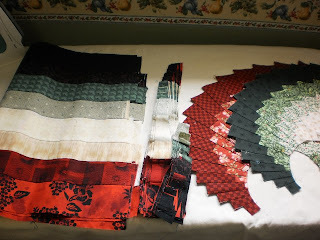 I have a little more work to do on my workshop sample set, but here are my three samples that show the 3 main stages of making the Spicy Spiral Christmas Table runner. Looks simple, doesn't it. It is. But in making several of these so far, I have definitely come up with some important tips and techniques to share with my spicy students. Are you intrigued? Maybe your guild will host this workshop. So, that's two of my Christmas in July projects sewn and as I write this, I'm just taking a break from working on my third project. It's turning out so nice, but you'll have to wait a day or two to see it. so, I am telling everyone who is looking at this blog... the pictures don't do that spicy spiral any justice... I saw it in person on the weekend and it took my breath away!!!!! What a great and fun and unique project! I want to learn! Gail, I love this spiral table runner! Since I don't live close enough to take your class, any chance of you making a tutorial for us? I would love to know all your secrets to the construction. Its true! I saw this in person and it is gorgeous! Made me excited for the Christmas season! Hello there! I happened upon your blog and saw this table runner - it's beautiful! I've been trying to find something new for my table for this Christmas! Is there any way you could send along a tutorial? Or a few simple instructions? I would SO LOVE to try to make this! Thank you in advance! Hello there! 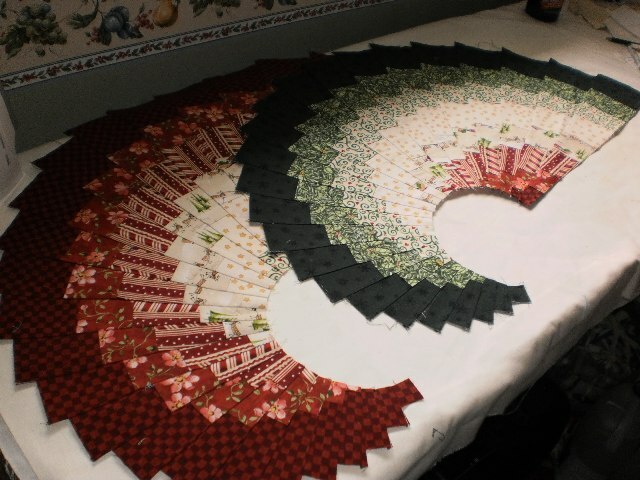 I happened upon your blog as I was trying to find inspiration for a new table runner for my table this Christmas. I LOVE this runner! Is there any way you would email a tutorial, or a few simple instructions? I would SO appreciate it! Have a beautiful day! I would love a pattern and instructions. I'm brand new to this site. I just signed up tonight.